The single most important thing to know about aquarium salt is that it isn't a cure-all. While salt can fix some problems, it won't fix them all, and in some cases it can actually create problems all its own. So before adding salt to a freshwater aquarium or pond you need to be sure it'll do some good. In this article we'll start by looking at why aquarists use salt so readily, even though it isn't always an appropriate treatment or additive. We'll then look at when salt is an appropriate treatment and how much to use. We'll then round off this article with a look at the risks associated with using salt, and why regularly adding salt to a freshwater aquarium or pond isn't necessary. To understand why aquarium salt is widely sold, and why fishkeepers use salt so freely, you need to know some aquarium history. Up until the 1980s, most fishkeepers believed that water changes should be minimised. 'Old water' was thought to be good for the fish, so water changes were often limited to around 20% per month. With such small water changes, nitrate levels were often very high. At high concentrations, nitrate can be toxic to fish, but sodium chloride reduces the toxicity of nitrate. While aquarists didn't necessarily know this, what was observed was that fish were often healthier in tanks with a bit of salt added to the water. From the 1980s onwards, the value of 'old water' was called into question. Compared to preceding generations, aquarists were now keeping much more delicate fish species, such as Malawian and Tanganyikan cichlids, and it was quickly discovered that they were very sensitive to high nitrate concentrations. It was soon realised that not just cichlids but all fish benefitted from regular water changes, and now it is recommended that aquarists change at least 20-25% of the water in an aquarium per week. Now that nitrate levels are kept low through water changes, the usefulness of salt in reducing the toxicity of nitrate is much diminished. Indeed, as we'll see later on, any slight benefits it still has in this regard may be outweighed by the stress it can cause fish that are intolerant of constant exposure to salted water. Vets and aquarium health experts usually describe the amount of salt required in grammes per litre. Rather conveniently, a level teaspoon contains about 6 grammes of salt, so a dose of 2 g/l can be translated as 1 teaspoon per 3 litres. If you don't know the capacity of your aquarium in litres, multiply by its capacity in US gallons by 3.79. For example, a 55-gallon aquarium has a capacity of 208 litres. Salt is used in two different ways, baths and dips. A 'bath' means the fish is constantly exposed to the salt. In other words, the salt is added to the aquarium. A 'dip' is something the fish is briefly dipped into, typically a bucket of aquarium or pond water into which some salt has been added. Don't add the salt directly to the aquarium. Instead measure out the amount you need into a jug, add some warm water, stir until its all dissolved, and then slowly pour the salt solution into the aquarium. Low salinity solutions can be added to the aquarium in one go, but if the required salinity is more than 2 g/l, it is best to add the salty water in portions across several hours. This will give the fish some time to adapt to the change in salinity. Suppose you're treating whitespot in an aquarium measuring 208 litres (55 US gallons). The required salt concentration is 2 g/l, or 416 grammes for the whole aquarium. This would be first measured out using kitchen scales, then tipped into a jug, dissolved in warm water, and finally poured into the aquarium. Although they are very useful, dips can be risky if not done carefully. Most fish find saltwater dips intensely stressful, so the fishkeeper must watch the fish carefully and remove it if it shows any signs of severe distress, such as rolling over onto its side. Start by putting some pond or aquarium water into a bucket or some other suitable container large enough that the net holding the fish can be submerged easily. Stir in the required amount of salt. In the case of leech removal for example, a dosage of 9 grammes per litre would be required. So if the bucket used holds 15 litres of water, 135 grammes of salt would need to be added. Once the salt is fully dissolved, the fish will need to be netted out of the pond or aquarium, and then lowered carefully into the saltwater dip. The fish will need to be completely submerged, so it's important that the net being used is large enough to hold the fish comfortably. While the fish is being dipped, keep an eye on both the clock and on the fish. Depending on the type of fish and its size, dips can last anything up to half an hour. Generally, the longer the better, but the tolerance of the fish will likely place an upper limit on how long it can be safely dipped for. After the dip is completed, take the net back to the pond or aquarium, and rest the fish in the water until it is fully recovered. Once it looks settled, release it from the net. Discard the dip water after use. Salt reduces the toxicity of nitrite and nitrate. While nitrate rarely reaches dangerous levels in a properly maintained aquarium, nitrite levels above zero are commonly seen in overcrowded or immature aquaria. As a short term measure, the addition of 1 gramme of salt per litre of water will reduce stress and minimise the problems caused by stress, such as finrot. Note that the use of salt doesn't eliminate the need to fix whatever problems are causing the non-zero nitrite level. A prophylactic treatment is one that prevents rather than cures disease. When fish are injured they can succumb to secondary infections such as finrot and fungus. 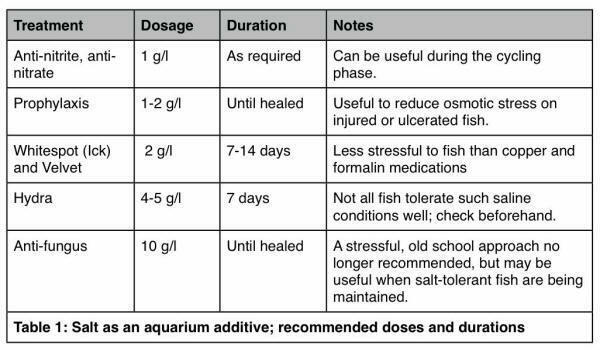 By maintaining an injured fish is slightly salt water, osmotic stress is reduced, and this prevents the fish from becoming weakened. This in turn ensures its immune system works properly, and so the chances of secondary infection are reduced. Add salt at a dose of 1-2 g/l. Maintain this level of salinity until the wounds are healed. The free-living stages of ciliate protozoans including whitespot (ick) and velvet are less tolerant of salt than are fish. When the cysts burst and the free-living stages enter the water, they are dehydrated by the salt and die. The recommended concentration is 2 g/l, and this should be maintained for at least 7 days, and preferably 14 days. To speed up the emergence of the free-living stages, the water temperature should be raised to at least 28 degrees C (82 degrees F) and ideally 30 degrees C (86 degrees F). Because warm water contains less oxygen than cool water, increase aeration and/or water circulation if the fish show signs of respiratory distress, such as gasping at the surface. Hydra is a tiny, anemone-like animal that normally does little harm but can be a pest in breeding tanks because its stinging tentacles can catch and eat fry. A concentration of 4-5 g/l will kill Hydra within a week, but note that soft water fish in particular may not tolerate such salty water well. If necessary, remove the fish from the infested aquarium while it is being treated. Fungi are mostly intolerant of brackish and saltwater conditions, and moderately high concentration of salt have been used to treat fungal infections. A concentration of 10 g/l is required, about 30% the salinity of normal seawater. This is well above the tolerances of most freshwater fish. So while this treatment can be effective, it is best reserved for those freshwater fish with a high tolerance of brackish water: livebearers, gobies, pufferfish, tilapiine cichlids, killifish, and so on. Strongly saline water is useful as a treatment for leeches. Rather than as an addition to the pond or aquarium, the salt is used at a concentration of 9 g/l to create a dip. The infected fish is dipped into this solution for up to 30 minutes, by which point the leeches will detach themselves from the fish. The leeches can then be destroyed and the fish returned to the pond or aquarium. Because leeches leave behind open wounds, some sort of prophylactic treatment against secondary infections will probably be required. Slime disease is caused by a variety of parasitic protozoans such as Ichthyobodo (Costia) spp. that cause the skin to produce unusually large quantities of mucous. Salt needs to be used in two ways to treat slime disease. Firstly, the salinity of the aquarium needs to be raised to about 3-5 g/l, and the aquarium left this way for 7-14 days. Secondly, on the first day of treatment, the infected fish should be dipped into a strongly saline solution containing 20-35 g/l. This will help clear up the mucous and speed up recovery, but such salty dips are very stressful for most freshwater fish. While dips of up to 20 minutes should be safe in most cases, if the fish shows signs of severe stress, such as rolling onto its back, it should be immediately returned to the aquarium. Exposing freshwater fish to saltwater conditions for varying periods of time can be a good way to shift external parasites such as fish lice and anchor worms. The required concentration is 35 g/l. However, this is a risky treatment because freshwater fish do not tolerate sudden and extreme increases in salinity very well. Large fish (such as adult goldfish) and salt-tolerant fish (such as tilapiine cichlids) tolerate saltwater dips between than small fish and soft water fish. It's also worth noting that removing parasites this way doesn't prevent re-infection, so some treatment of the pond or aquarium will be necessary. There's absolutely no need to add salt to freshwater aquaria except under the circumstances described above. At best, it'll do nothing of any value at all. At worst, it'll stress salt-intolerant fish, making them more vulnerable to disease and less likely to live to a ripe old age. By itself salt merely raises the salinity, not the pH and hardness. Marine salt mix can be used to raise pH and hardness since it contains not just salt but a variety of other mineral salts as well, but only in aquaria where salt-tolerant freshwater fish are being kept, such as guppies or mollies. While it has some preventative value, as mentioned above, salt has little impact on opportunistic bacterial infections once they are established. To treat these a proper antibacterial or antibiotic medication will be required. Salt will treat fungal infections, but as described earlier, the required concentration is so high that it isn't a safe treatment for most freshwater fish. Malawi Bloat is a Dropsy-like syndrome typically observed among Malawian and Tanganyikan cichlids, hence the name. Affected fish are bloated, have trouble breathing, become lethargic, and eventually die. There is no reliable cure, which is why prevention is so important. Several causes of Malawi Bloat have been identified, including the use of salt in Rift Valley aquaria in the mistaken belief that salt hardens the water and raises the pH. Salt does neither of these things. To create hard water conditions a proper Rift Valley salt mix needs to be used, either purchased ready made, or mixed at home from Epsom salt, baking soda and marine salt mix. Fish and plants from mineral-poor waters do not appreciate being kept in slightly saline water conditions. One reason aquarists got away with adding salt to freshwater tanks in the past was that the species being kept were usually hard, adaptable species able to adjust to a range of water conditions. But many of the most popular fish today, like cardinal tetras and rasboras, come from soft water habitats. Short term exposure to low salt concentrations across a few days or a couple of weeks won't do them any harm, but constant use of salt in their aquaria could cause problems. Like freshwater fish, plants tolerate salt to varying degrees. Low concentrations, up to 2 g/l, won't do them any harm, but above 5 g/l most freshwater plants will be stressed and eventually killed. 1. To raise general hardness. Epsom salt may be used on its own or as part of a Rift Valley Salt Mix of the sort useful in tanks holding hard water fish such as Mbuna, Tanganyikan cichlids, Central American cichlids and Central American livebearers. To create very hard water around 20 degrees dH, a dosage of around 1 tablespoon Epsom salt per 5 US gallons/20 litres. For more, read A Practical Approach To Water Chemistry. 2. To treat swelling, constipation, dropsy, pop-eye, etc. Epsom salt is a mild muscle relaxant that can be useful when treating swelling and bloating. It works as a laxative, with a dosage of 1-3 teaspoons per 5 gallons/20 litresbeing recommended depending on the severity of the case. Raising the temperature by a degree or two often helps by speeding up the fish's metabolism, and the use of fibre-rich foods such as cooked peas is extremely helpful. Why Epsom salt helps with dropsy and pop-eye is less clear, but it can be helpful and is worth using alongside whatever antibiotic treatments are being used. Possibly the Epsom salt helps to draw fluid out of the swelling. In any case, the recommended dosage is again 1-3 teaspoons per 5 gallons/20 litres. Attached, the fruits of today's labour, what I hope plugs that gap in salt in freshwater aquaria. There are two tables, which you can put anywhere but I suspect would go into the "What salt treats" section nicely.